Players quitting chess - it is a recurrent theme. Some become insane (or evolve psychologically in such way that it is not possible to function anymore as the majority of the people), like Torre or Rubinstein and maybe you can also add Fischer. Chessplayers are just humans and this subset of the society contains also less beautiful aspects. Suicide (Oll and many others), alcoholism (Tal, Stahlberg), criminals (Norman Whitaker), illegal use of engines (many), hustlers (Gufeld), many passions (Aleister Crowley), are also showing up between chessplayers. But I won't talk about those aspects in this article. 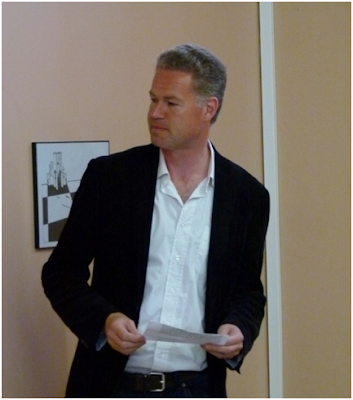 Recently Karel Van der Weide (already known from “Chess for housewives” - see picture) presented his new book in Gent. It is rather a collection of articles which he wrote earlier and now bundled as some sort of personal chess-testament. The book is easy reading and the games are excellent. Van der Weide was an attacking player and this book is surely top in that area. Lay-out and illustrations could be slightly improved but the young publishing house Thinkers’ Publishing has just started so will surely improve. At the presentation he analyzed casually 2 beautiful games of which especially his win against Piket stuck (not captured in the book). Of course the conversation turned to the topic why he quit chess. It was very recognizable: no progression anymore, a too difficult living of chess, too little support from the federation, no social status of the profession. In the book Van der Weide also elaborates on some characteristics which enlighten his decision to quit. E.g. when he enjoyed resting in his hotel-room instead of joining the closure-banquet of a tournament or when he prefers the order and silence of a tournament in Austria instead of the half-drunk atmosphere of the Open Gent. Such characteristics are not necessary linked to quitting chess but it is part of the personality (I also prefer a good book above moderate company or a meaningless conversation) which does point to this direction. If the essence of the motivation disappears then all the other side-activities (travelling, ceremonies, absence from home, irrelevant comments, bad conditions...) which are whether or not obligatory, become suddenly annoying and stimulate the decision to quit. I can well imagine that KVDW is strict for himself and put the bar high as chessplayer. Once you can't obtain a certain level anymore then other aspects of the way of living are not out-weighted anymore by the joy of playing chess. Again I find this very recognizable and more or less was the reason why I stopped (I don't want to compare my strength at all with KVDW). It is not really because I gradually decline but more that I more and more often mess up well played games with blunders. You can be beaten by an equal or stronger player but to throw points away against weaker players is something very different. You can compare this with a 1500 meter runner increasingly losing won races because he is not able anymore to tie his shoes properly. Only the very passionate chessplayers are in such conditions able to continue playing. The number of former-chessplayers is large - much larger than the number of active ones, which always shrinks. Known former-players there are plenty - and I don't mean the retired player trying to make some extras on top of his pension by writing (Hans Ree and Genna Sosonko are respectable examples, still contributing literature to the chessculture). I talk about people left the game behind and built up another career. Somebody like Kenneth Rogoff by example, IGM but now PhD and professor economics. Even Josh Waitzkin, famous from the chessmovie Searching for Bobby Fischer, became later still (in 2004) Worldchampion Tai Chi. The recently passed away Richard Von Weiszäcker (see Schachbund and chessbase) was surely also a good player, but will be remembered by something very different. Locally I also know some good clubplayers having continued their academic career in USA and quit chess as a hobby. You can't tell them they were wrong when they achieve a much higher level professionally than chess ever could offer. Besides there are also topplayers more or less forced to quit. It seems Danailov, manager of Topalov has played a role in the short career of Valeri Salov. Topalov met with Salov an opponent with an intangible positional style. Danailov appears to put pressure on the organizers so if Topalov participated, Salov would not be invited. Seems, appears,... in any case if somebody tries to google Valeri Salov then you find nothing anymore after his career. He said himself in an interview of 2009 that his criticism on Kasparov stopped invitations for top-tournaments. I can well imagine that the youth of today does not know very well Salov - in the end his career was relatively short. To get acquainted with him I recommend the exciting game against Karpov from Rotterdam 1989 - maybe no absolute top-game, but part of the legendary 0/3 by which Karpov threw away an almost guaranteed tournament-victory (and maybe even the win in the World Cup). His most beautiful victory was probably the Polugaevskytournament in Buenos Aires 1994, in which the Sicilian was mandatory - Salov didn't even have 1.e4 in his repertoire ! The most famous and recent example of the voluntary exit is surely Gata Kamsky, once arrived in America (after his lost Worldchampionship-finale in 1996 against Karpov) stopped playing chess to study medicines and law. He made a successful comeback from 2004 which even impressed Kasparov. Kamsky has stated earlier to retire from chess if he will be 40 but he passed that point and he still continues maybe because of new challenges posed by Nakamura, So and Caruana. Enrique Mecking, a worldclass-player, stopped when we was seriously ill, but also he came eventually back - a good but not a brilliant comeback. The opposite of the early 'quitters' are the dinosaurs of chess. Kortchnoi, Reshevsky, Najdorf, Smyslov, Lasker, Mieses… kept playing at a very high age on a respectable level. Nakamura already declared that he doesn't consider a good example of professionalism to play at a high age like Kortchnoi even in a wheelchair. Besides young players get this way a chance to play against a living legend. This last aspect always fascinated me - contact with the past. To play against somebody who has known people you only know from books or databases. Afek wrote once in an issue of New in Chess (year 2000) about his (far) familymember I.M. Vistanieckis, still active at a very high age (he was the oldest I.M. in the world) and defeating young players in Israel - but also played in the years 20-30 of the previous century against people like Mikenas. Conclusion: quitting early chess is part of life - also other sports have their quitters (without being negative about it). Life goes on and everybody makes choices. I believe the interest for chess often stays (a bit like a smoker having quit smoking), but it is suppressed till the moment is ripe again. The most beautiful example is of course the congenial Jan Rooze, one of the biggest talents of his generation in Belgium but he chose for a professional career instead. Only after his retirement he again picked up chess and managed to excel by achieving an European title and the IM-title. Maybe he is the example the quitters need to follow?